Flight Lessons | Phaedrus rides a motorcycle, too, you know! The view from the road surface a few minutes after the accident. I’m just happy to be alive, but my motorbike lies wasted. Riding the fabulous roads in the Harz mountains yesterday, I got involved in a crash when an oncoming VW Golf driver turned left at a T-junction regardless of my right-of-way. I could brake but neither stop nor dodge. Witnesses said I flew over the Golf’s roof, rolled over my right shoulder and skidded along the road on my knees and the helmet. The first thing I remember (though I wasn’t out) is sitting on the road facing against the driving direction. I checked myself and found I had nothing apart from bruises and hematomas. Thank God for my luck, the very protective riding suit from Touratech / Stadler and the BMW System helmet 6. My BMW R 1200 GS Adventure took the brunt of it. The fork got bent back further than the motor block and ripped out of the upper clamps, the front wheel destroyed, the frame warped and she spilled all her fluids. Witnesses, the policemen recording the crash, the firemen removing this mess and the driver of the recovery truck all said she was a total loss. I hope my adversary’s insurance will replace her in full. 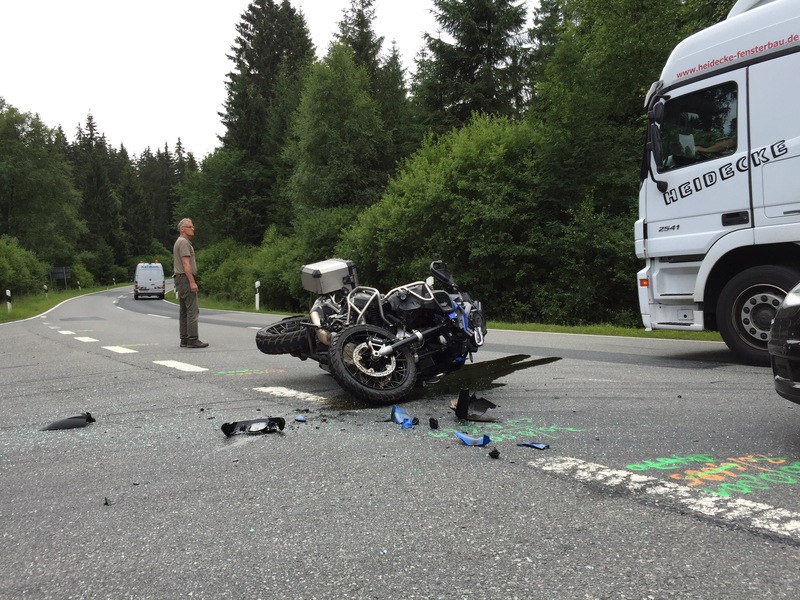 This entry was posted in accident, BMW, motorbike, motorcycle, R 1200 GS Adventure, right-of-way and tagged "dress for the crash not for the ride", motorbike, Motorbike accident, motorcycle, motorcycle accident. Bookmark the permalink. Hopefully the driver gets a hefty ticket too. So cool you avoided a bad one and now you’ve got a parts bike! Crikey! Well done on not becoming deaded! Scary picture… 😦 But at the end good to read that your body is in a much better condition than the status of the Gummikow…. Good bless you, take care! Yeah, I know. And a tan one. Pingback: The Hill You Face | Phaedrus rides a motorcycle, too, you know! Pingback: Same Difference, Yet New | Phaedrus rides a motorcycle, too, you know! Pingback: On The Paths Of My Childhood | Phaedrus rides a motorcycle, too, you know! Pingback: Hopes for 2018 | Phaedrus rides a motorcycle, too, you know!